Chelsea Handler, whose favorite pastime is shouting abuse at conservatives on Twitter, often calling them Nazis, was just informed on TV that her grandfather was an actual Nazi. 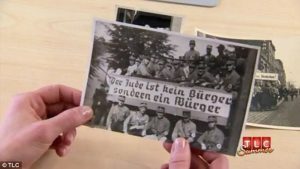 In a new episode of TLC’s Who Do You Think You Are, Chelsea Handler discovers exactly what role her grandfather, Karl Stoecker, played in World War 2, and the history of her family. Quivering and shaking after being told the news, Handler traces his path from Nazi soldier to American immigrant through documents and interviews with sources familiar with her family’s history. Daily Mail reports: Growing up, Handler had no idea that her grandfather – a ‘very, very strong man‘ she describes as having a ‘sense of humour‘ – had a dark past. In the episode, she reveals that he was taken as a prisoner of war to America, where he likely stayed in Montana for several years. Sometimes it is shocking to discover what we have in our family tree – both good and bad. Maybe now Handler won’t be so quick to loosely toss around the insults by calling someone a nazi. Next articleHow Well do You Know the Liberal Lexicon?